Community Gardening for Idiots-back home: Rhubarb, rhubarb again! 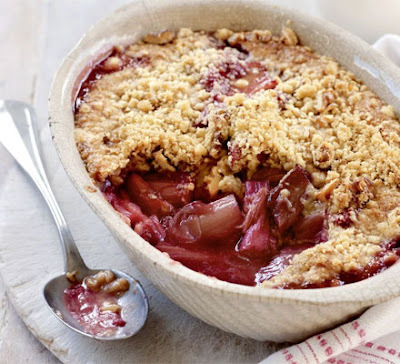 If you have been a faithful reader of this blog and even if you are a faithless one you might have noticed Ms Tagalong's obsession with rhubarb. It is that time of year; the crowns of rhubarb in the garden are sprouting very large, very healthy looking leaves. Unfortunately the stalks don't live up to the promise, being short, stumpy ones with very little rhubarb colour. Luckily Ms Tagalong spied some rhubarb in the greengrocer's and managed to make some rhubarb and ginger crumble. With the addition of chopped fresh ginger and brown sugar it looked delicious ready to be covered with crumble. The lack of oats did not deter Ms Tagalong and she improvised with some muesli. If only she had checked the oven temperature! Alerted by the charcoal aroma, Ms Tagalong managed to scrape off the black peanuts and raisins off the top and it was really still rather respectable. There was another swarm of bees in the garden this weekend, this time of a two legged variety, diligently labouring away during the hot and sweaty day. Ms Nimblefingers, particularly, was galvanised into a frenzy; maybe fueled by the wonderful homemade pizzas Little Miss Pretty and friends had concocted for the pizza oven. Others helped turn the composts, build another, sow plants and seeds and water the new seedlings which will need regular dampening if they are to survive the long hot summer. A stinking hot day of 38 degrees this week was fortunately followed by some cooler breezes culminating in some welcoming rain. No watering needed today and a replenishment of the tanks. Wow...I love rhubarb too. I love the taste, the versatile nature of this vegetable, and that it is SUCH a frugal vegetable to grow. It almost thrives on neglect, and gives a huge harvest that is so easy to freeze. I have begun a website devoted only and entirely to RHUBARB. Feel free to try out the recipes! My favourite is the muffin recipes! I really think you can make almost anything with rhubarb! !